The Learning Studio is an incubator classroom of 24 seats which is made available to faculty first through a proposal review process. 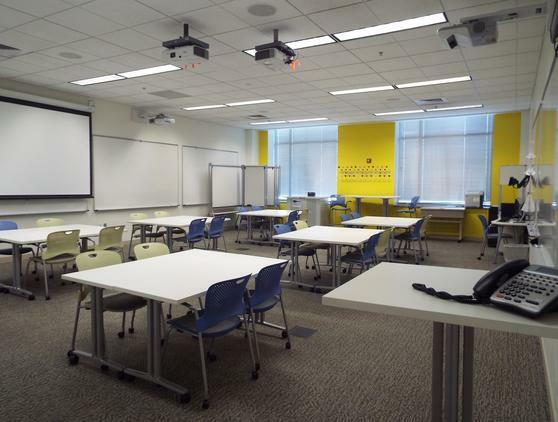 WHY TEACH IN THE LEARNING STUDIO The flexible furnishings, multiple display points, complete instructor mobility, laptop cart and large number of writing spaces make the Learning Studio a powerful partner in faculty instruction. Faculty members teaching in the space are afforded significant instructional design support, and earn professional development credit for developing and revising elements of their instruction. Use of the space and the development work associated with revising instruction can be reported as part of the faculty member's MAPS. The intentional use of The Learning Studio as an incubator for piloting impactful teaching practices aligns with HCC's Academic Plan, item 1.1C-1 to "Support instructional innovation through professional development activities appropriate to individual academic areas and disciplines as well as methods of instructional delivery". 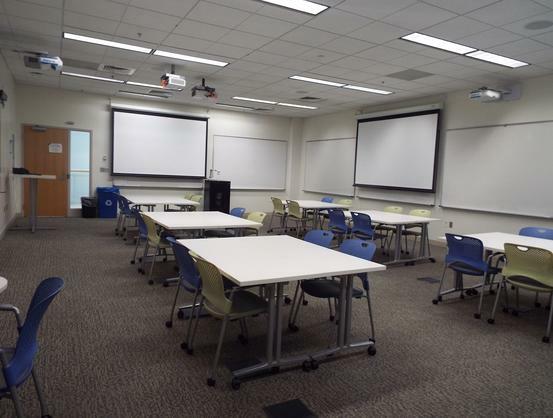 Faculty applicants who wish to use the room as part of a teaching improvement or promotion project or piloting of a new teaching approach are encouraged to apply for use of the room for the Fall 2019 semester by completing the request form here. Faculty can view a sample video of how the room has been used in the past - courtesy of Dr. Judith Kizzie. Faculty will meet with the other members of the Fall 2019 teaching cohort for a room orientation and kickoff in May 2019. They will meet with cohort again following the Fall 2019 semester. Faculty will choose a specific lesson that they would like to revise for the Fall 2019 semester and will meet with an instructional designer to for support in the redesign of that lesson/activity or assessment. Faculty will earn professional development credit for their cohort orientation, work with the instructional designer; and debrief and sharing of what they developed while teaching in the Learning Studio.